A common phenomenon that can be observed in the countries where members of International Network of Engaged Buddhists (INEB) boddhisattvas been operating, especially in South and Southeast Asia, is that the people have not yet achieved enduring peace and social justice. Every country continues to be influenced by capitalism and authoritarianism from the colonial era until the recent era of globalization. The common experience shared by the third world countries is dominanated by the business corporate sector (transnational corporate, national corporate, IMF, World Bank, ADB, WTO, etc.) and the non-democratic or pseudo-democratic governments. These two sectors’ powerful influence adversely impacts everyone. As humans we have become increasingly aware that the predominant threat to the planet is the ecological price of human consumption and lifestyle. Former values such as simplicity, sufficiency and sharing within the community have gone by the wayside or minimized as they are fueled by a capitalistic ideology that relies on mass production to maximize profit. This change increased greed-based values brought about selfishness, competition, oppression, and exploitation among humans and against nature. These conditions make achieving real peace in any context diffiult. Instead, structural violence and injustice have created conditions of poverty, ecological crisis, hunger, human rights violations, discrimination and conflicts at many levels. When the material development becomes the personal and national goal, it overshadows values such as compassion, simplicity, forming relationships, sharing, and forgiveness. The degradation of the human spirit is, in fact, due to many factors. Firstly, it becomes more difficult for people resist the temptations of indulgence, wealth and fame that the modern world presents to them. In additon, people become victims and are forced to struggle and survive in violent, corrupted and unjust social structures. We can see those forces also erroding many societies’ traditions. The future of humankind relies on its young generation. However, growing up in divided society makes it very difficult for them to realize their potential and positively contribute to society. A great deal of youth’s vitality is expended because of the impact of structural violence, namely – poverty, ill health and many other social and economic inequities in education, housing, employmet, and so forth. These conditions create disparities and instability, particularly in communities where development is imbalanced. Fortunately, some Buddhist thinkers and social activists have proposed alternative views and practices to create societies based on compassion and non-violence which are key Buddhist values. These are intended to reverse the negative outcomes brought about by the development route that Third World countries have taken. What the Buddha set forth more than 2,500 years ago was means of discovering truth/dharma that has been passed down to us through the ages. These truths transcend time and remain relevant today. In modern times the Buddhas’ teachings are being applied across Asia using many means to achieve social justice and equity. For example, the Dhammic socialism by Bhikkhu Buddhadasa, Meritism (vis-à-vis capitalism) by the Asoke Network, critical thinking as taught by Ajaan Sulak Sivaraksa, to discourses on Gross National Happiness. Other experiments include the Samdrup Jonghkar Inititative inspired by Buddhist teachers likes Dzongsar Khyentse Rinpoche, Buddhist models of leadership and Governance: His Holiness the Dalai Lama, Samdhong Rinpoche, as well as peace and ecological actions by many Buddhist movements of the Karmapa, and Thich Naht Than. Therefore the socially engaged Buddhist movements which become internationally renowned are quite substantial and strong people’s movements throughout South and Southeast Asia, and worldwide. As the struggle for genuine peace and social justice continues with many movements contributing various alternative views and actions, the engaged Buddhist movements, too, join them. Among these movements, one of our most valuable resources is the youth. In order for young Buddhists to realize their human potential to contribute to real change, INEB is taking the responsibility to develop the confidence, capacity and commitment among the young Buddhists for social and spiritual transformation. We need to be able to distinguish between cultural practises of Buddhism that are bound by time and change, and the timeless teachings of the Buddha that are essential for this world that become our road maps for a peaceful and sustainable world. To understand theory and develop critical ability for using analytical Buddhist tools to apply to alternative methods of community development. 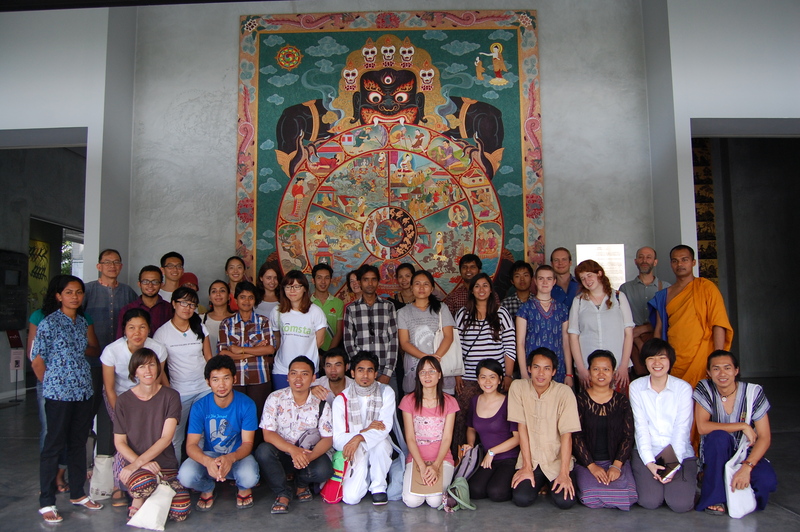 To strengthen the network through supporting cooperation and relationships among young Buddhist activists in Asia. Specific outcomes will be incorporated into actition plans developed throughout the training. These will reflect worldview and attitudinal changes using Buddhist analysis. Outcomes will be at several levels including: personal, organisational, country and regional. The training curriculum is based on three-mode learning process involving intellectual, spiritual and physical practice. The sessions include lectures, discussion, community building, meditation and group processes, as well exposure trips to understand the current situation in Taiwan and how socially engaged Buddhism is being used to address it. Young potential female and male leaders active in social change. Ordained or lay persons, Buddhist and others. From Asia including the INEB network and beyond. Select participants are responsible for the cost of airfare and their visa. I am from Bangladesh and engaged with Parbatya Bouddha Mission(PBM) which is a non-profit, socio-economic and religious development organisation in the country. I am interested to participate in this program . What is the academic competency to be qualified for the training program? Whether it is funded by the organisers or self-funded?